Ziplining over alligator-infested waters wasn’t the first thing I envisioned when I heard about a family-friendly “exotic petting zoo” located just outside of Shreveport, Louisiana. Nor was it anything I’d expected to do when packing my bags for the annual conference of the North American Travel Journalists Association, held just 10 minutes away. But when invited to harness up and experience the 7-line course firsthand, where zip-liners of any age can soar above alligator ponds, over camels and kangaroos, and narrowly between oak trees, you can bet I signed on for the adventure. As it turned out, ziplining over alligators was only part of the thrill awaiting us at Gators & Friends Alligator Park and Exotic Petting Zoo. The adventurers in my group quickly agreed that climbing the first multi-story spiral staircase as it gently rocked from the foot traffic was anything but dull. Our guides quickly clipped us each to a safety line as we reached the platform of our first departure, and there we waited in the order of our ascent, approaching the edge like soldiers waiting to exit an airplane mid-flight. The first step–off of the platform–is the hardest. That’s when I remembered there’s a big difference between wanting to try something new and exciting and actually taking that first step–in this case, off of a metal mesh platform three stories up through which I see an alligator smiling. Once I was off and flying above the alligator pond, whooping with the wind in my teeth as I grinned down at the reptiles below, I was hooked. Just landed after my first short zip line run at Gators & Friends. While there is no minimum age required for ziplining at Gators & Friends, zip-ees must weigh a minimum of 60 lbs. to go solo. Smaller children, and those who don’t want to go it alone, can zip tandem with either of the certified guides on staff (ask for my pals Luke and Kent). Too small–or too scared–to go it alone? Go tandem with pro zip-liners Luke and Kent. Our guides could not have been kinder or funnier as they talked us each off of the ledge, sometimes when the opposite end of the zip line was not even visible. In time, I gained confidence enough to try spinning in a complete circle–and captured it here on video. Another confidence booster was that our harnesses were a class above those used at most zip line parks. Straps go over the shoulders as well as around the sitting zone, which not only helps you zipline hands-free without feeling like potential alligator bait, but also gives you the ability to zipline safely upside-down should the spirit move you. Just do be sure to empty your pockets and secure your car keys before trying it. 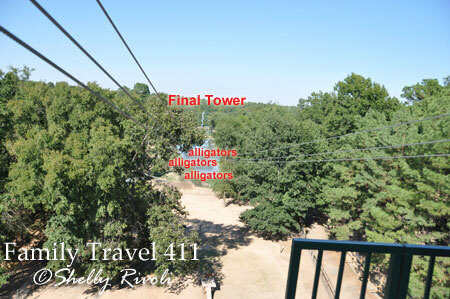 As I mention in The 411 on Shreveport with Kids, there is more to do at Gators & Friends than just the zip line adventure. So if there are other members of your family who would prefer to visit the capybara and feed the goats or ride a miniature horse while you and your tween tear up the zip line course, options abound. Admission to the petting zoo area is included with 7- and 10-line course purchases, so make sure you stop by to take your picture holding a baby alligator before you leave. There are also alligator feedings to watch throughout the day, though if you plan to zipline, I suggest you wait to watch the feeding frenzy until after you’ve completed the course. There are more of them in there than you might think. The view from the last platform at Gators & Friends with the side-by-side run.The tiny spiral in the distance is your final destination. Good luck! Plan – Gators & Friends is open daily through summer and Wednesdays through Sundays the rest of the year. See the current hours on their website. Wear – While the majority of animals at Gators & Friends won’t give two hoots about what you wear, the alligators take a special interest in flip-flops falling from the sky. All zipliners are required to wear closed toe shoes. Find – Gators & Friends is located just off I-20 10 miles west of Shreveport at 11441 US HWY 80, officially in Greenwood, LA. Click here for specific directions and a map. Commit – Be sure everyone in your group who signs on to zipline is ready to follow through as there are no refunds given once you reach the first platform. Three packages are offered: 4 lines at $34.95, 7 lines at $64.95, and 10 lines at $79.95 (3 of the 7 lines are repeated). Unload – Lockers are available if you need to secure or stow anything you don’t want in your pockets or on your person while ziplining. Also, you can leave your child’s stroller in the car and rent a little red wagon (which handles the gravely paths much better) for only $1. Eat – There is a snack bar on site with corn dogs, chips, crawfish pies, pizza, and icy drinks. Feed – Cups of animal feed are available for purchase, and one complimentary cup is included for all zipliners. For more information about Gators & Friends, visit www.gatorsandfriends.com or call 1-318-938-1199. For more family-friendly recommendations in this area, see The 411 on Shreveport with Kids. For a comprehensive guide to attractions and events in the Shreveport-Boissier area, visit www.shreveport-bossier.org. CRAZY!! and crazy fun, it looks like! That it was! I realized later how lucky I was that I wore closed-toe shoes that day, when I might have had on regular Tevas. I wouldn’t have been allowed to zipline if I had! Zip lining Yes! Aligators, no thank you! 🙂 Looks like fun. Once you get going, it’s all good! You’d love it, Heidi! They are just like big friendly dogs who are not friendly, are even bigger than dogs, and could swallow you for a snack. Other than that, you wouldn’t be nervous in the least bit, I am sure! Honestly, this looks like a lot of fun. Shreveport, Louisiana is definitely not the first place I’d think of finding a place to go zip-lining, though!